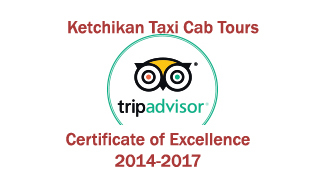 KTCT fills a demand for inexpensive yet knowledgeable, personalized, narrated tours of Ketchikan. Our excursions offer the independent traveler a relaxed, intimate experience to view the many attractions on the island.We often describe the summer in Southeast Alaska as “seasons within seasons”. Our tours cover the must sees and quite a few side trips as well. From totem pole parks and native culture to wildlife and the rain forest. We seldom do the same tour twice as each group is different and unique. Makes it fun for us too! 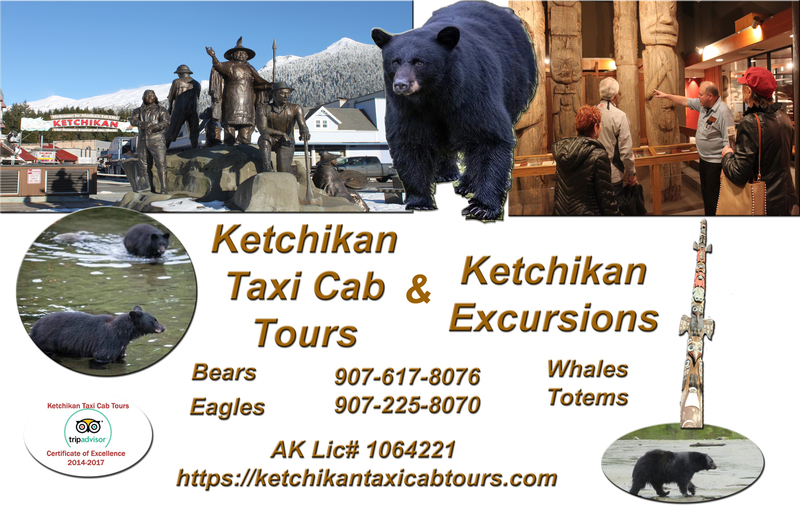 We explain to our groups in a 3-4 hour tour we will cover about 3-6 different tours that the cruise ships offer all rolled into one complete tour of Ketchikan. No buses, no lines and crowds, plenty of time for photo-ops, bathroom breaks, and just taking it all in! We are $80 an hour for THE VAN and can carry up to 6 people. Our average group size is 4 and we often just have a couple on tour. We do have a number of vans. Almost daily we are using 2-4 vans on one tour. With only 35 miles of road on the island it is easy to follow each other. Each van has plenty of storage for collapsible wheelchairs, small electric scooters, and walkers. We supply binoculars & umbrellas. We also allow food and drinks in the vans.Tours average about 3 hours. We just pro-rate the time by the quarter hour. 50% deposit needed refundable up to 24 hours before your tour. We accept cash or credit cards on the day of the tour or you can pay ahead of time via Paypal. For more information and testimonials about our tours check out; cruisecritic.com and trip-advisor.com. We will email you to let you know we received your information and have you booked. We will meet you by your ship at the time you want us there. A Deposit is needed of 50% this is refunded up to 48 hrs cancelled before your tour. A $20.00 fee is charge for same day cancelled tour. Did you like our service ?